1st Century AD Roman or Romano-British Iron Slag at Hemyock Castle. Industries. Export Trades"
These webpages use pottery sherds (fragments) & objects found at Hemyock Castle, to explore centuries of close links with continental Europe: Links to other webpages in this series. This First century iron slag from Roman or Romano-British iron smelting, was found deep inside the masonry of Hemyock Castle&apos;s walls. The remains of both slag-pit and tapping type furnaces have been found on sites near Hemyock Castle. Slag-pit types of smelting furnaces were used from the Iron Age, before the Roman invasion, and were re-introduced after the Roman period. During the Roman and the early medieval periods, tapping types of furnaces were more common. Remains of both types of furnaces were found in excavations at nearby Churchills Farm; Remains of slag-pit furnaces were found at a nearby site along Culmstock Road. The different types of furnaces were possibly chosen to suit different types of iron-bearing rocks. 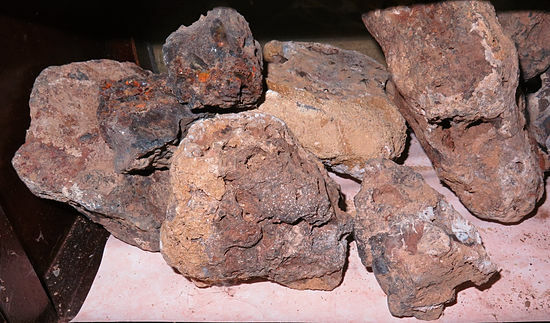 Rocks found in the Blackdown Hills, contained enough iron to make its extraction worthwhile. Nearby, there were deposits of clay suitable for making the furnaces, and wood to make into the charcoal fuel. 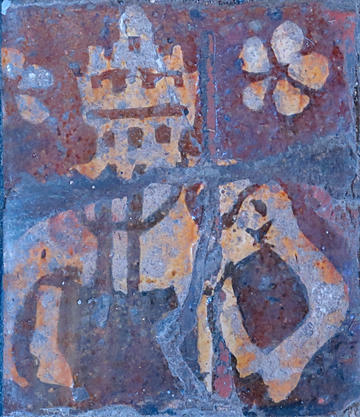 Some of the waste iron slag was used in buildings, including for Hemyock Castle. Hemyock&apos;s other main industries included agriculture, wool, cloth manufacture, potteries, and mineral extraction. Some of these were indigenous; others were introduced or improved by outsiders, including by the Cistercian monks from the nearby Dunkeswell Abbey: Cistercian monks are credited with developing and transferring novel agricultural and manufacturing technologies throughout Europe & England; the Cistercians saw this as an important part of their religious duty. Ideas, new manufacturing processes for metals, glass & other goods, and even architectural styles were brought back from the medieval Crusades to the Holy Land. The plan of Hemyock Castle owes much to fortifications developed there. Later, other groups brought new ideas & improvements; including Huguenots exiled from France, particularly after King Louis XIV issued the 1685 Edict of Fontainebleau, which greatly increased repression of these French Protestants. Some skilled Huguenots settled in the South West and improved the local lace-making industry around Honiton, Exeter & Tiverton. As well as benefits, international trade & migration also brought risks & tensions. There were several outbreaks of the Black Death and plague during the medieval period; presumably spread along trade routes. There were also times when problems in far-off countries seriously affected local industries by disrupting international trade or by undercutting prices of locally produced goods. During the medieval period, there were important European manufacturing centres including in Flanders (Belgium) and Florence. There were important European markets and (trade) fairs including at Bruges (Belgium) and around Troyes (France). English raw materials & finished goods were traded through these markets & fairs; imports were bought there. Some of this international trade followed old Roman routes or pilgrim routes. Overland routes were used mostly for compact, higher-value cargoes; sea routes were used for heavier cargoes, despite the perils and pirates, including pirates who operated from the Christian state of Catalonia, especially during the 13th and 14th centuries. Barbary pirates or corsairs from north Africa were a menace to shipping and even to coastal settlements around England’s West Country (as well as to coastal settlements in Europe) from the 16th century until France invaded Algiers in 1830. These pirates attacked coastal settlements, trading vessels and fishermen. They captured, held for ransom, and sold into slavery well over a million (non Muslim) men, women and children: They were forbidden to enslave fellow Muslims. During the late 17th & early 18th centuries, England was already in turmoil over repeated Jacobite campaigns to reinstate the Stuart monarchy. Many prominent people in the South West, supported the Jacobite cause. As usual, supporters exploited other grievances to help their cause. Several times, local people, especially men, were required to take various public oaths to prove their loyalty to the Crown. The local cloth-making and serge-making industries were already going through difficult times. These tensions led to several strikes and riots, including in 1724, by weavers at nearby Culmstock. In 1717, during the Great Northern War (1710 – 1721), England joined the alliance with Tsarist Russia against the powerful Swedish Empire, and King George I banned England&apos;s trade with Sweden. By December 1717, mobs of clothiers in Exeter were reportedly demanding a new English parliament which would remove this English ban on trade with Sweden that was wrecking their livelihoods. In other riots, workers complained that dodgy traders were exploiting their position to undercut export prices charged by legitimate cloth businesses. Apparently, the Madrid government was planning to embargo delivery of a different, relatively small arms export delivery to Saudi Arabia, as a protest against Saudi Arabia&apos;s actions in Yemen. But Saudi Arabia reacted by threatening the cancellation of all contracts with Spain. Workers in the Cadiz shipyard (far from Madrid, in the autonomous community of Andalusia) feared losing their livelihoods and took to the streets. The Madrid government removed the embargo. Was this recent situation in Spain, similar to that in Tiverton in 1717? European Year of Cultural Heritage – UK is the UK&apos;s part of The European Year of Cultural Heritage, a new European initiative.